Stashes are online storage that we provide for faculty, staff, or researchers in the mcecs college. The CAT gives out stashes to researchers or professors to hold large quantities of data that will not fit in their normally allocated space. Stashes are generally used as a virtual “dropbox” for capstone projects, or by professors for their labs and classes. Student groups like the ACM or the computer science tutors can also use stashes. Stashes are not a way for students to get extra hard drive space. If you have filled up your quota on your student account, you should move or delete anything that is not important. If you are a student, your sponsor must be a professor or researcher. We will not delete your stash space without your knowledge. We will email you at the specified expiry time and ask you if you are still using your stash space. If you are still using your stash space you will be able to set a new expiry date. If you ask for an abnormally large amount of space, you will be asked to justify why you need that much space. 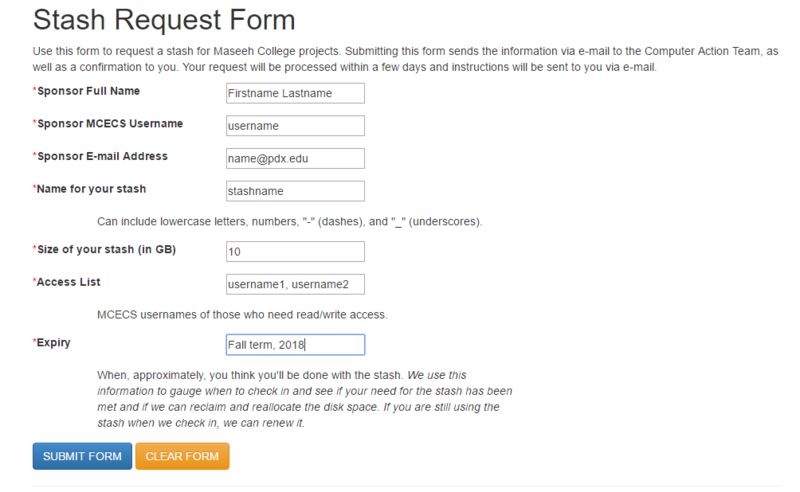 Your email does not need to be your mcecs email – you may use any address you like. Once you have filled out the web form, please give us a few days to respond to your request. The response will come to the email address you provided in the web form.